At the top of the new fall menu at Root 246 is a famous quote from beloved chef and television personality Julia Child. The quote is a fitting kickoff not just for the menu but for the chef behind its execution. Chef Crystal "Pink" DeLongpré, the former owner and head chef behind Solvang's Bacon and Brine, is back with a promising new menu and a bold vision for the esteemed restaurant. 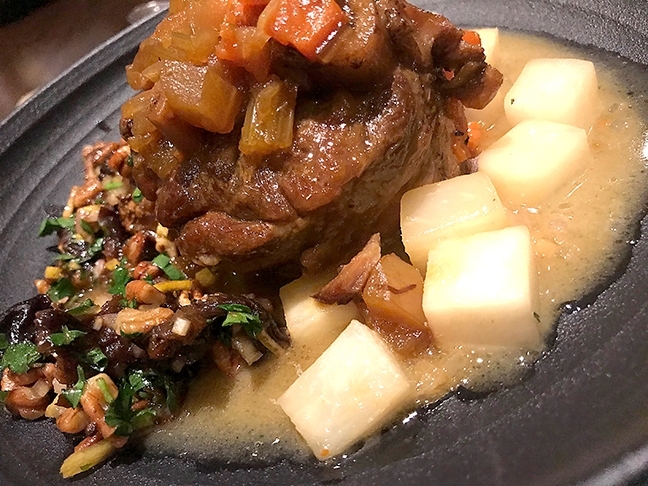 Chef Crystal “Pink” DeLongpré’s eagerly awaited new menu at Root 246 features a melt-off-the-bone osso bucco made with pork from Niman Ranch, braised baby turnips, and preserved lemon and prune gremolata. Technically she was never really gone. When Bacon and Brine shuttered in August 2017, Chef Pink jumped right back into what she does best. "It was pretty heartbreaking," she said of her restaurant's closing. "I ended up coming here two weeks after we closed. I didn't really have any downtime, I didn't take any time to grieve." She said at the time, the only place locally she really had her eye on was Root 246. Luckily, they jumped at the chance, and the result is an exciting new menu that does a good job reflecting who their unique chef is as well as the region the restaurant is in. "When I took over there was a lot of really conflicting flavors," Chef Pink said. "There was nothing from any of the local farms. I was French trained, so I've always been doing farm-to-table, for 20 years. That was the main thing." Her approach was to wipe the slate clean, rather than approaching each menu item and redesigning it. The process was slow, as to avoid alienating loyal customers Root 246 didn't want to lose. Some small changes started emerging in the summer menu. But the new fall menu is a true reflection of the new direction at Root 246. 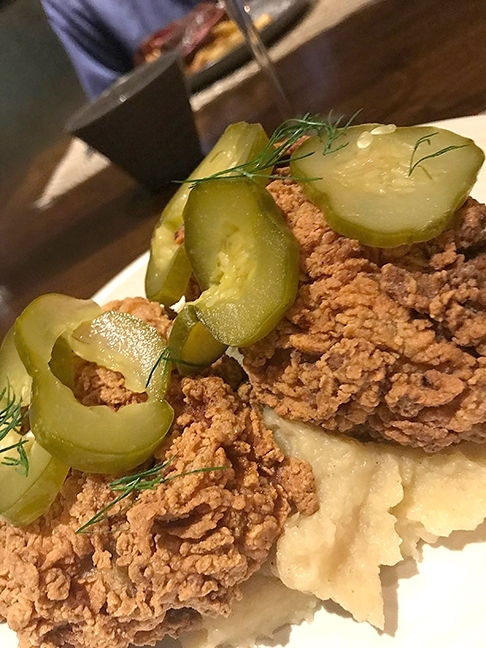 Root 246’s new menu features Legit Fried Chicken, a dish made with brined chicken and Yukon Gold mashed potatoes, served with slices of house pickles. "We wanted a menu you could throw a dart at and everyone at your table could eat," Chef Pink said. 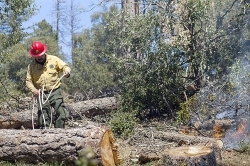 "It was really just shaking everything down and seeing everything that fell out of the tree and looking up and seeing something that was really bare. That was easier than trying to change things on the menu." The menu is captivating, to say the least. Reading it is its own journey, exploring the many ways Chef Pink and the staff aim to tell the story of local food in the Santa Ynez Valley. It's a celebration of who we are through the lens of the food we eat, and it's refreshing to see Root 246 embrace the ideas behind it. It features a selection of sharing plates, reasonably priced between $7 and $14. The ideas behind the selection of starters are bold and playful, very much the kinds of thing one has a come to expect from Chef Pink. She has the uncanny ability to zero in on a particular flavor or food component and isolate it, embracing the core of your favorite food and finding the best ingredients and techniques to really make the tasting notes stand out. Highlights include the Brussels sprouts, served with toasted sesame seeds and a garlic-tamari sauce; smoked local white sea bass served on rye bread with creme fraiche (which is a fun play on bagel and lox with a shmear); and grilled wild shrimp served with a heavenly peanut mole sauce. The shrimp was a very strong dish; the citrusy heat in the marinade played well with the creamy texture of the mole. 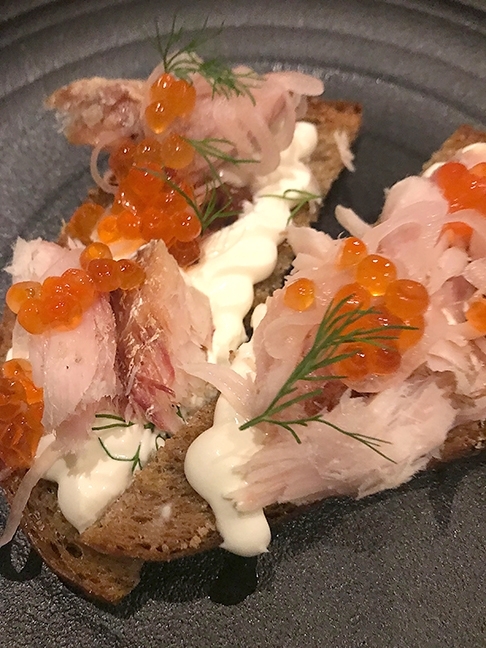 Locally sourced smoked sea bass topped with salmon caviar, dill, and creme fraiche atop rye bread make up one of the many unique starters and sharing plates on the new fall menu at Root 246 in Solvang. The pâté was a genuine star. The bread is made from wild yeast by Baker's Table, based in Santa Ynez. But the secret is the addition of an IPA vinegar that plays smartly with the rye bread. "When you train in Paris, you better have your pâté game," Chef Pink said. "We're using a company called Minus 8 vinegars. They make vinegars in the same fashion they would make an icewine." The "beer" flavor comes from a beer vinegar made in the style of an India Pale Ale with a blend of aromatic hops and icewine grapes. It's an intriguing flavor on the palate, combined with crispy shallots and parsley. The entree menu (dubbed "large-format") includes dishes you would expect such as hamburgers and three different steak options along with some real surprises. The first dish that is a must-try is Chef Pink's osso bucco, which is one of the best I've ever had. It is expertly prepared, made with locally sourced pork from from Niman Ranch and served with braised baby turnips (I loved this as an alternative to a traditional starch or vegetable), preserved lemon, and a prune gremolata. Root 246 is located at 420 Alisal Road, Solvang. For more information call (805) 686-8681. The flat iron steak was hearty, and the twice-fried french fries were exemplary as was the au jus sauce it is served with. It's a dish that feels a bit more casual and relaxed in what could be a fussy environment. The octopus stew was a mixed bag; the octopus itself was prepared well but the cannellini beans with the house bacon came off a little salty. The absolute masterpiece on the menu is the Legit Fried Chicken, a dish it's almost impossible to compare to any other fried chicken. The secret is in a skin that is crispy and well flavored and doesn't feel greasy or heavy. It's served (as it should be) with a helping of dill pickles and mashed potatoes that feel like they were made with the best butter ever produced in the galaxy. My initial take on the new Root 246 menu is that I love it. I loved everything about it and about the overall changes. Root 246 was always a great restaurant but now it's on the cusp of becoming the best restaurant. My main concerns were I felt a little too much restraint, if anything, coming from this chef whose cooking is so well known and liked. There was only one pork option (and multiple red meat options), which is something I would definitely like to see more of. Chef Pink is renowned for her skill with the other white meat, and that menu would certainly benefit from it. Also, the price points are absolutely perfect. Keeping price points low eliminates a lot of barriers for new and younger customers, which could be a great thing for Root 246. All of the dishes feel inviting, the kinds of things you would want to share with a large group of friends looking for a fun night out. It's a great start for a chef who appreciates people like us who just absolutely love to eat. Arts and Lifestyle Writer Rebecca Rose is always down for fried chicken. Contact her at rrose@santamariasun.com. • Hello, I am now officially on the Fatte's Pizza bandwagon. Their pizzas are really flavorful, especially the crust. I usually get a sausage, pepperoni, onion, and black olive pizza (perfect flavor combination for a pizza), but if you want to really see where Fatte's shines, try the Chorizo Combo made with chorizo, jalapeños, onions, tomatoes, and bacon. Fatte's is located at 1772 S. Broadway, Santa Maria. 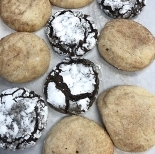 • Did someone say snickerdoodles (pictured)? Why, yes, I did. 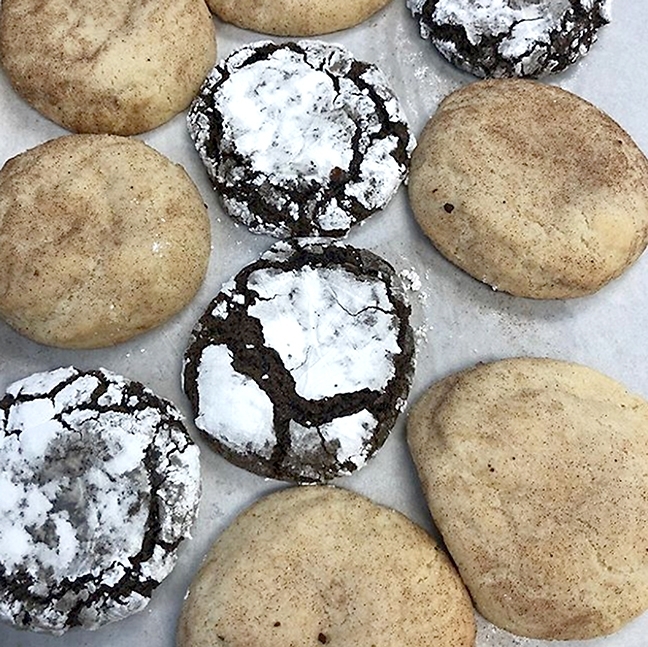 And so did someone at Pattibakes because they are baking them up fresh just for us, along with peanut butter cookies and good ole' chocolate chip. The bakery is also offering special holiday treats to order including apple bread pudding, scones, coffee cakes, and pies. Get yours at 240 E. Highway 246, suite 109, Buellton. • Tres Hermanas Winery is now selling a line of Rose City Pepperheads pepper jelly. Varieties include Apricot With an Attitude, Sneaky Ghost, and Crazy Cranberry. Sounds right up my alley. Check them out and the wines to pair with the jellies at 9660 Foxen Canyon Road, Santa Maria. • You better sit down for this one. 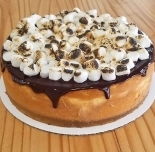 Orcutt Bakery has a brand new cheesecake: toasted marshmallow (pictured above). 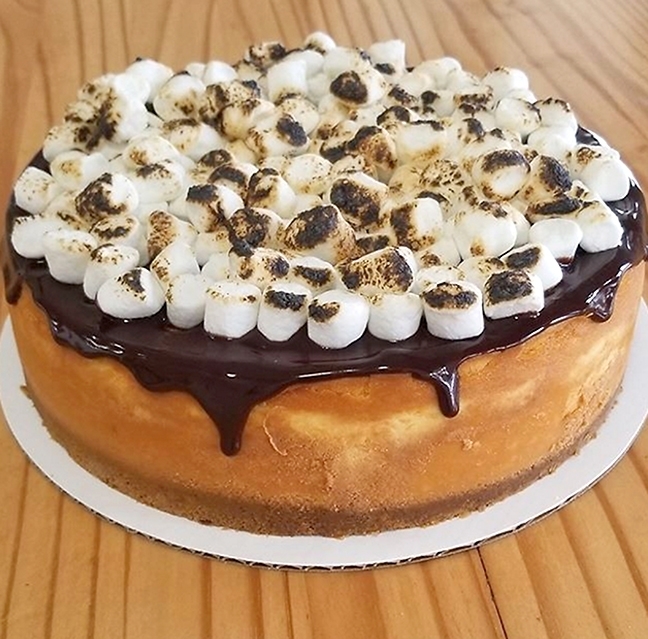 It's a New York style cheesecake topped with a chocolate ganache and perfectly toasted marshmallows. It's like comfort food died and went to chocolate heaven. Pick up a slice at 4869 S. Bradley Road, suite 112, Orcutt. • If you're in need of challah bread for the holidays, check out Good Seed Coffee for a fresh baked local option. Call before 10 a.m. daily to order or drop in to see them at 1607 Mission Drive, Solvang. • Foxen Canyon Wine Trail's annual Christmas on the Trail is back, a sure sign that Santa Claus is just around the corner. From Dec. 8 through 13, for $45, your ticket gets 20, 1-ounce pours of wine from 13 participating wineries all weekend. Wineries will also feature snacks and a free wine glass. Get yours online at foxencanyonwinetrail.net. • On Dec. 15, Municipal Winemakers tasting room in Los Alamos is hosting a Holiday Charcuterie Workshop. The workshop will teach the finer points of pairing cheeses; attendees also get a wood and marble cutting board to take home. Tickets are $69 available for purchase online at my805tix.com.